CAA administers several programs through the North State Food Bank, one of which is the Emergency Food Assistance Program through the USDA, and provides 53 food pantries in their service region, with USDA commodities that get distributed to low-income families. At the end of August is was figured that so far in 2018, they had distributed close to 25,000 boxes of food that has fed around 44,000 individuals through this program. The events are rewarding because the recipients are super grateful, which reminds employees and volunteers that the work they do is good work. The North State Food Bank also participates in a program called Donate Don’t Dump, which provides fresh produce from farmers and supplements commodities. They try to distribute the goods at events they call “tailgates.” These “tailgates” happen throughout the entire service region. They pull up to a designated area and distribute 3,000 to 4,000 pounds of fresh produce to anyone who wants to line up and self-certify that they need it. The Donate Don’t Dump is an opportunity for farmers and packers to divert food that they would probably put in the landfill. Instead, the food gets taken and distributed to people in need. Last year, Donate Don’t Dump gave 180,000 pounds of produce away. The Farmed Kids program is similar to Donate Don’t Dump. They partner with Center for Healthy Communities at Chico State to put on farmers markets for kids. Local elementary schools that are in disadvantaged areas come up with a learning objective for children, and once they complete the learning objective, they’re given a little ticket which they can use to shop in the kid’s farmers market. The program tries to provide approximately 10 pounds of food per child that they can take home to their families. All over the service community Centers for Healthy Communities will come along and support the community by providing food. They also partner with CalFresh Outreach, which tries to connect food insecure households with this sustainable resource for food. This happens all throughout the region, but they're located in Butte County. North State Food Bank’s headquarters are located in Oroville. Their mission is to provide food for the 53 pantries in their service area. They couldn’t do everything they do without their small group of employees, the help of good partnerships and the amount of people who volunteer their time. Community Action Agency is partnering with the Jesus Center on a CalRecycle grant. The grant diverts food from the landfill in order to reduce greenhouse emissions, more details will be coming out later. Moving forward though, they're going to need to partner with restaurants, stores, businesses, and schools to divert this food for direct use. If the food isn't good for human consumption it can be used to feed animals. If the food isn’t good for even animal consumption there's a bio-digestor out at the old rendering plant that can take the food too. The bio-digestor would then use the food to create good clean energy. The entire process is something that they're excited to be involved in, and partnering with the Jesus Center is great opportunity to work with a great group of folks who are also doing good work in the community. Historically, CAA has relied on contracts and grants like so many other social service agencies around. Yet, grants can go away, contracts get cut back, and donors fall through. Therefore, CAA is expanding into some different fundraising opportunities that you’ll begin to hear a lot more of in the news and other announcements. 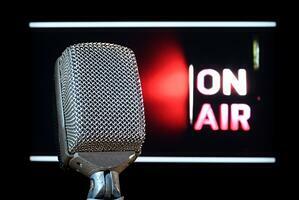 CAA does need the support of the community. They need people to come forward to donate (whether with food, time, or money). Find out how to donate here! 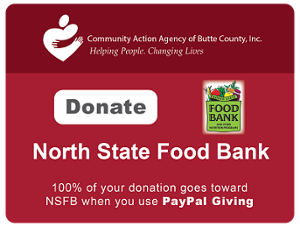 You can also donate directly to the North State Food Bank by clicking on the button below. Learn other ways you can help here.